Japanese Prime Minister Shinzo Abe, left, shakes hands with Russian President Vladimir Putin prior to their talks during the G-20 Summit in Antalya, Turkey, Monday, Nov. 16, 2015. 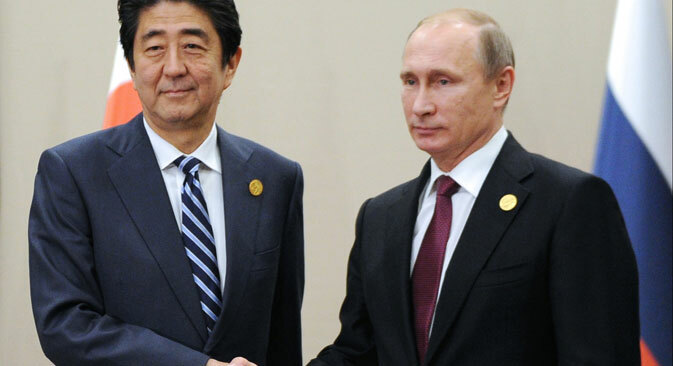 According to Russian Foreign Ministry, the U.S. put pressure on Shinzo Abe. The United States has put pressure on Japan in the context of Japanese Prime Minister Shinzo Abe's planned visit to Russia, and this has narrowed contacts between the two countries, Russian Foreign Ministry spokesperson Maria Zakharova said on April 16. "There has been pressure and a strong recommendation, which has not minimized but narrowed our contacts and has somewhat curtailed the work on the bilateral level in general," Zakharova said in an interview with RT.